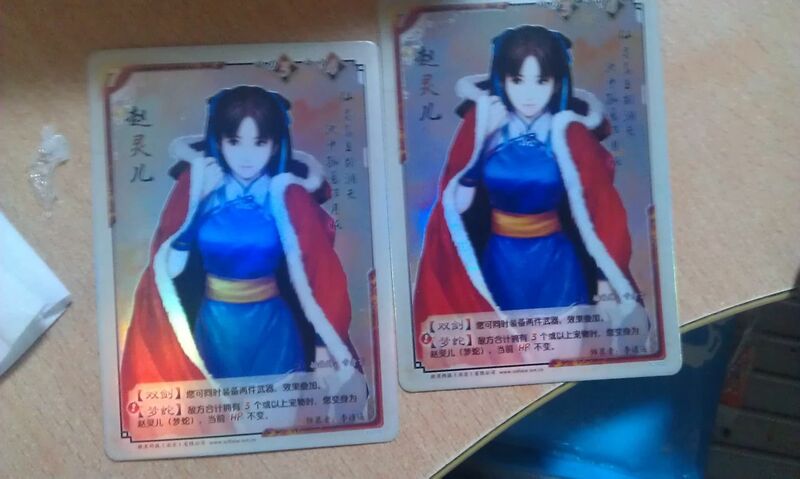 I've seen pictures of these for a while and it looks like they're trading cards of some sort. Could someone please translate these articles and let us know what they're about pretty please? Disclaimer: I'm not a professional translator. Blah blah, you know the rest. I'll only translate the second article because the third is outdated, and the first is basically a sales site (and they did not include Yue Ru as a character for whom you can specify a "flash card"). Pcpop's card section, 7th Feb. Today we officially announce that the tabletop card game Xian Jian Qi Xia Zhuan - Xiao Yao You will be officially on sale on the 15th of March. This time, official sources has revealed that there will be two box designs: the Si Hai Xiao Yao (standard version) and the Hui Hun Xian Meng (Luxury Edition). Xian Jian Qi Xia Zhuan - Xiao Yao You is a tabletop card game developed by Beijing Softstar (a subsidiary of Softstar Entertainment, Inc), with the "Father of Xian Jian" himself, Yao Zhuang Xian at the helm of things. With party adventuring, cooperative competition, challenging monsters and collecting pets at its core, the game can be played by 2-8 participants. Characters from various Xian Jian generations will appear in coherence with the traditional Xian Jian theme. Players will be split into two parties; with a strong feeling of synergy within the parties, and a strong sense of competition between them. How interesting and fun! One will meet all kinds of NPCs who will be helpful after satisfying certain criteria, thus creating the extraordinary experience of a RPG. A while before, said tabletop game had a small beta test, and the gameplay and content got a majority of positive responses. Professionals in this field pointed out that the game had especially good offline interaction and online expansion possibilities, and it has garner much attention within the market. With the success of the San Guo Sha card and online game, tabletop games has proven to be a market with impressive potential, continuing the trend from online web/client games and mobile games. Following the rights to sell the Xian Jian card game, it would be natural for Baiyou to develop online games with tabletop card games as a base. yay!! Thanks so much for that ^^ Definitely gives us a general idea about them! I wonder how you play them.. O_o Also saw that there's 3D cards too? How does that work? Then perhaps you might care to explain to Jennifer on how to play it, wind23? Or if you don't mind, you could send a legible picture of the rules to me, and I'll do it. By the way, the picture you attached can't be seen by non-Baidu account holders. @Jennifer: The third article in your OP says the main point of the game is not the traditional card gaming method of direct Player vs Player, but rather one party tries to take on monsters while the other party tries to deter the first party. You CAN directly attack the opposing party, but you need rare player attack cards. Reason I didn't translate this was because that article was from the beta experience, and I'm not sure if anything has changed about the gameplay since then. God wrote: Then perhaps you might care to explain to Jennifer on how to play it, wind23? Or if you don't mind, you could send a legible picture of the rules to me, and I'll do it. By the way, the picture you attached can't be seen by non-Baidu account holders. The first link is for the junior mode of this game, and the second link is for the senior mode. The official website of this game is http://xyy.baiyou100.com/, maybe more informations can be got from here.